The Fed left interest rates unchanged in March 2019, but is hinting of a definite rate rise later in the year dependent on data. A Fed rate rise adds to the private sector debt interest burden. Strong employment numbers and stronger core inflation numbers point to further Fed rate rises. A Fed rate rise adds to Treasury bond interest income and interest on reserves and bank interest income from loans. A larger share of GDP goes to bankers' profits and less to household and business with each rate rise. An interest rate rise means that a full inversion of the yield curve and subsequent recession move ever closer. 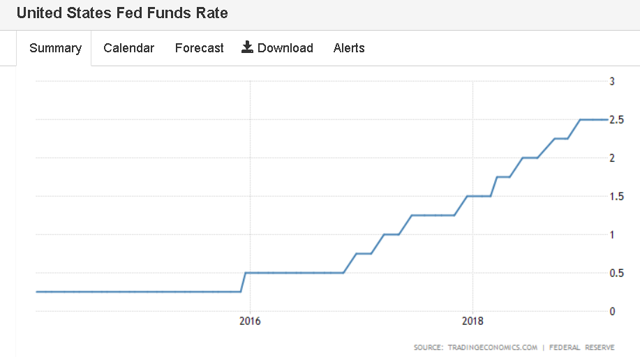 This article provides an impact assessment of the FOMC April/May30-1 2019 meeting and a possible rise in the Federal Funds Rate (FFR) to 2.75%. 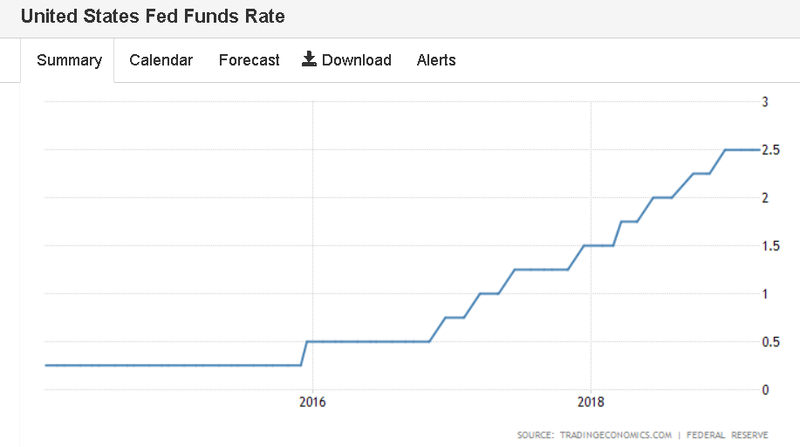 The Federal Reserve held the target range for FFR at 2.25-2.5 percent during its policy meeting of March 2019 and reaffirmed its position to be patient about further policy firming in light of recent global economic and financial developments and muted inflation pressures. The chart below shows the current FFR situation. Interest paid on excess reserves, also known as the support rate. These four impacts will be looked at in turn. The chart below shows the stock of private debt as a percentage of GDP. One sees the most current level of private debt-to-GDP is 202.8% for 2017. The table below shows the impact of the rate hike on bank reserves advanced by the Fed, via the discount window, when a bank makes a loan. Highlighted in green is the new level. Loans create deposits and generate reserves at the Fed. The Fed creates the reserves on demand as part of the federal payments system. If not able to access reserve funds from other commercial banks on the interbank market, a bank can always access reserves from the Fed at the FFR. The interbank rate is shown in the chart below and shows that at present commercial banks would be better off obtaining their required reserves from the Fed discount window at 2.5% rather than the current 2.7% interbank rate. Every 0.25% rate movement changes the cost of loan funds by $10 billion. The private banks then pass on this rate change to the customer if they can. An FFR increase is a giant, economy-wide tax on borrowers and lenders. Each time the Fed raises 0.25%, it moves $10 billion from the private sector to the government sector. The Fed is the national government's bank and remits its profits to the federal government in the same way that it pays taxes from the private sector to the government. The national government is the issuer of the dollar; it has as many dollars as it wishes to create, and does not need to get them from an outside source. The $10 billion income stream to the government from a Fed rate rise is deleted from existence in the same way as national taxes. It is a net reduction in the money supply. It exists on no measure of any money supply after remittance, not M1, M2 or M3, and is a contractionary and deflationary impact at the macro level. The following table shows the impact of the rate on the stock of private debt in absolute terms and as a percentage of GDP. Highlighted in green is the likely new FFR. The chart shows that with each 0.25% FFR rise, $98 billion, or 0.53% of GDP, is transferred from the household and business sector to the finance sector in a macro intersectoral income transfer. At present, just over 5% of GDP goes to banks as interest on loans, money not spent on real goods and services. At the macro level, this has no impact on the net money supply, as it stays the same. The most significant effect is the transfer of income from businesses and households to the banking sector. This transfer of income causes what Professor Michael Hudson terms debt deflation and is also known as secular stagnation. 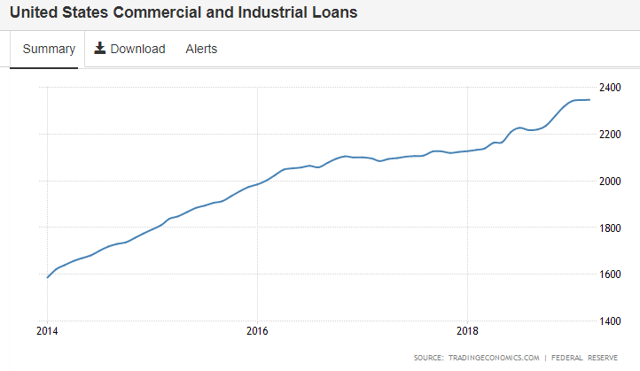 Debt Deflation: The financial stage following debt-leveraged asset-price inflation, which leaves a residue of debt once new lending stops and repayment time arrives. The term was coined in 1933 by Irving Fisher to explain how bankruptcies and the difficulty of paying debts wiped out bank credit and hence the ability of economies to invest and hire new workers. Paying debt service diverts spending away from consumer goods and new business investment. - Hudson, Michael. J IS FOR JUNK ECONOMICS: A Guide To Reality In An Age Of Deception (Kindle Locations 1728-1733). ISLET/Verlag. Kindle Edition. It is this factor that leads to Fed-induced recessions from rate rises. Another impact of a rate change is on Treasuries (also known as government debt). If there is a general rate rise, then the yield on Treasuries will also rise as new Treasuries issue at the new higher rate and existing ones trade on secondary markets for lower face values. Under current institutional arrangements, governments around the world voluntarily issue debt into the private bond markets to match $-for-$ their net spending flows in each period. A sovereign government within a fiat currency system does not have to issue any debt and could run continuous fiscal deficits (that is, forever) with a zero public debt. The following table shows the generalized impact of the rate rise on the stock of Treasuries. Highlighted in green is the new treasury target rate. The table above shows that with each 0.25% rate rise, some $55 billion of new money enters the private sector from the government sector. The positive side of the equation is that more dollars in the economy grow the economy. The treasury can pay any amount authorized by the national government. A monetarily sovereign national government creates money ad hoc as it spends. It is done by merely marking up bank accounts at the Federal Reserve Bank. If all the Treasury deposits were at the new rate of 2.75%, then the government would add about $606 billion to the economy each year from treasury interest payments alone. The entire national debt is a historical record of all the dollars the government spends into the economy that are not taxed back and are currently being held in the form of U.S. government securities, called treasuries. Actually, she said, the national debt clock is an asset clock. This interest payment gives the banks more income. As part of the Fed's monetary operations, it is required to swap bank reserves for Treasury deposits until reaching its target rate of 2.75%. An interest rate increase may lift the demand for treasury deposits. While domestically this is only a portfolio shift, it might improve the current account balance when foreigners buy more Treasuries, which, in turn, drives demand for the US dollar. A Treasury is a US dollar with an interest coupon. A US dollar is a zero coupon bond, and the cost of holding it is the interest rate charged by banks on credit money. The USD could well rise as demand for it grows relative to other currencies (UUP). 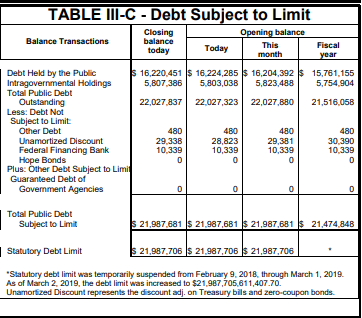 Government debt in the United States decreased to 22027880 USD million in March from 22115526 USD million in February 2019. The reason for this decrease is that the Treasury has reached the artificial debt ceiling limit, and this legally prevents it from issuing debt to match government spending. Accounting games are going on to maintain government operations while staying under the debt ceiling. The half a trillion flush of income tax "revenue" on 15th of April will enable the administration to stay under the debt ceiling a little longer. The fourth and last impact of an increase in the FFR. A phenomenon coming out of the 2007 Global Financial Crisis (GFC) boom/bust was the Federal Reserve would pay interest on excess bank reserves (IOER) held by commercial banks that had beforehand received no interest payment. This aspect gets almost no press coverage, and yet, the implications are enormous. The chart below shows the stock of excess bank reserves. The chart below shows the interest rate paid on excess bank reserves. The table below shows the official rates set by the Fed. 1.) The FFR will never fall below the IOER; the IOER is a support rate that sets a floor under interest rates. The implication is that instead of setting a target rate and selling and buying Treasuries to achieve the target rate, the same objective is achievable by fixing the support rate where the central bank wanted it to be. 2.) Banks receive free money. There are over $1.5 trillion of excess reserves sitting in the reserve accounts of US banks, and this earns them $36 billion per annum of income. Again, this is money created by marking up bank accounts, and is, therefore, high-powered sovereign money as opposed to debt-based credit money. Each time the FFR rises, the IOER set to just underneath it. Most likely an increase in FFR will lead to a rise in the support rate to 2.65%, and this will add a further $3.75 billion of money into the economy and bring the total paid per annum to $39.75 billion. This income adds to the bank's capital base, which, in turn, means it can increase its lending if creditworthy borrowers wish for a loan, or it could be paid out in dividends, stock buybacks or excessive executive remuneration. There are winners and losers from a Fed rate rise. Banks - On the one hand, banks must pay more for their borrowed reserves from the Fed when they make a loan. This rise is bad news for those that hold a lot of fixed-rate loans, as their margin gets squeezed. 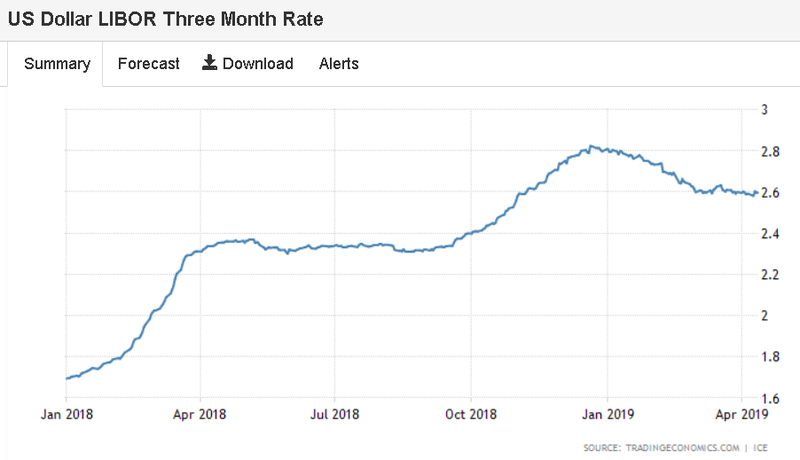 On the other hand, those banks that contain a lot of Adjusting Rate Mortgage (ARM) loans are anticipating or enjoying the triggering of exploding rates that are much more than the actual FFR rise. Banks slowly devour a larger and larger share of GDP with each rate rise for no additional effort and no actual production of a good or service. Increased loan interest from households and businesses on the existing loan book of over 200% of GDP. Interest on treasuries bought in exchange for excess reserves by the Federal Reserve. 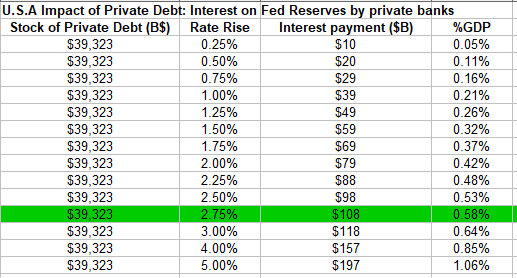 Interest paid on excess reserves by the Federal Reserve bank. Borrowers - They suffer when rates rise and benefit when they fall. Borrowers in the household and business sector get slowly squeezed with each rate rise. More and more income is devoted to debt service, and the appetite for more debt reduced. Aggregate demand falls, and unemployment and recession follow. The following table shows the impact on the macro money supply. More money added to the economy grows the economy, especially if matched to value creation and productive capacity. The latter tends not to happen, as the income distribution skews to the financial sector, which, in turn, tends to inflate the value of paper assets instead of creating new real assets by building and making things. One can have too much of a good thing, and the interest rate can go too high, as the table below shows. Five to six percent seems to be the limit, judging from the last two boom/bust events and the amount of private debt. What stands out at present, as compared to the pre-boom peaks of 2000 and 2007, is that credit creation is much weaker, as the table below shows. Perhaps a credit boom is still coming? Or it was a small one and is now over, as the chart below suggests. Credit creation has been flat since January this year. Where to invest and take advantage of this trend was discussed in this article, and the findings still stand and are reinforced by current trends. Diversified exposure to the American banking system and its many sub-sectors is via the ETFs listed below. I prefer KRE, as it is representative of domestic U.S. banks, which enjoy the full benefit of the rate rise. While the government sector contribution to the private sector remains positive, a recession is unlikely.